Steamed rice bran oil off the leaching process, rice bran metering cleaning and drying to leaching plant puffing, puffing bran rice bran oil extraction evaporation finished meal mixed solvent containing dissolved meal solvent recovery, extraction of crude oil condensate stripping off by puffing steam into the leaching plant after first to enter the extractor seal auger to seal the leak spilled solvent, bran into the extractor after puffing, split in different material lattice to be the way countercurrent leaching leaching cycle of six mixed the oil concentration is gradually reduced, and finally the purified extraction solvent, when rice bran oil in rice bran is running. Little, become bran meal, bran meal after drip dry by buried scraper conveyor transported to steam offline. 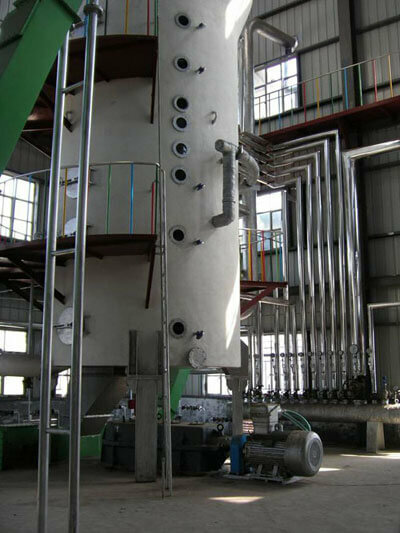 Steam offline role is to bran meal containing a large amount of organic solvent leaching after heating evaporation, so separated from the solvent bran meal, bran meal transported to the packing plant, the solvent is evaporated into a gas condensate recovery sent.